Our service gives business people a relaxed way to travel. We understand that travelling for work can be gruelling. With Kent Atlantic Limousines, business travellers will arrive at their destination in comfort and style. Wow your business partners by sending a stretch limousine to collect them. With one of our hired vehicles, you are assured of a dependable service that will transport you, or your guests, wherever you need to go. No more missed flights; no more need to flag down cabbies. With a hired limousine, all you need to worry about is your business and sealing those deals. Is your company sponsoring an event? Make your arrival dramatic. Alight from any of our premium limousines at your function and grab the spotlight. Kent Atlantic Limousines is proud to have a gem of a stretch limousine in its fleet: the red-roofed Lincoln. Our deluxe 8-seater stretch automobile is guaranteed to turn heads. 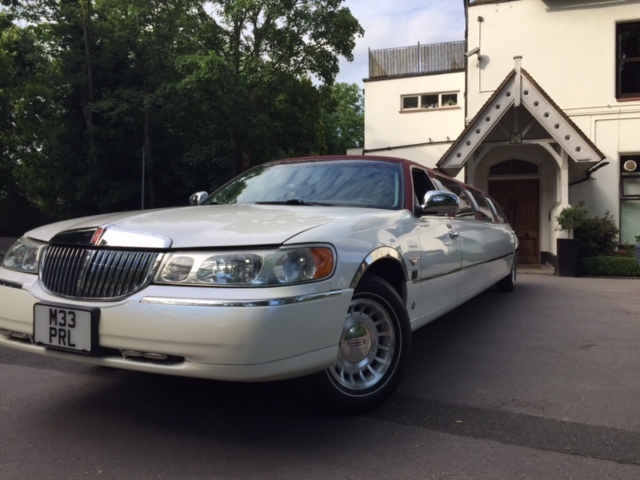 This special Lincoln is one of only two such vehicles in the UK. Are your business partners paying you a visit? Take them on a stylish tour of the top spots. A hired limo creates an atmosphere where you can really wind down and relax. You may even decide to enjoy a glass of bubbly while our chauffeur drives you from one sight to another. If there is no time for leisure, a limo can take you, your clients, or your visitors from meeting to meeting, without a hitch. As you travel you will have ample time to enjoy the upholstered seats and luxurious interiors of our fleet. All Kent Atlantic Limousines undergo maintenance to meet, and exceed, government standards. Our drivers undergo enhanced Criminal Records Bureau checks. With our unwavering commitment to service, Kent Atlantic Limousines is your top choice for business and corporate limousine needs. We have many options. Our Lincoln stretch limousine accommodates up to eight passengers. For groups of eight to thirteen, a Ford Excursion 4×4 is available. Call us now and reserve your ride!